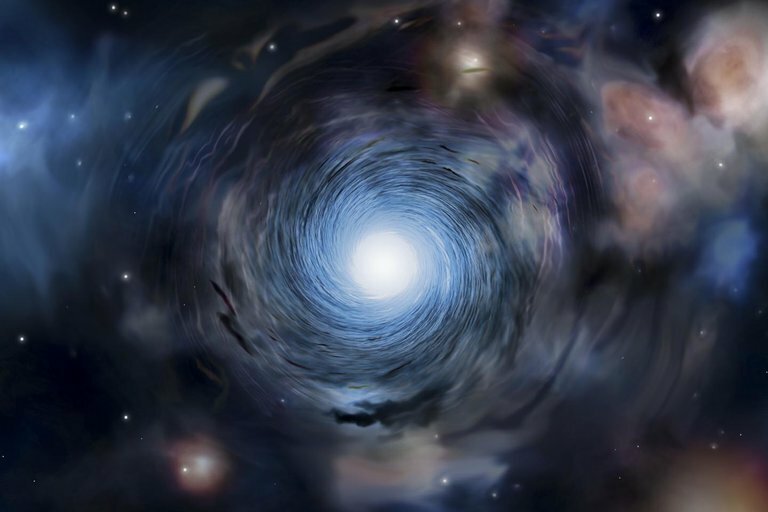 Astronomers observed two 13-billion-year-old galaxies spinning in whirlpool motions, which was thought to be characteristic of mature galaxies like ours. Astronomers have looked back nearly 13 billion years and found very early galaxies that exhibit a steady swirling motion, very similar to the spin of galaxies that exist today. This type of motion was not expected to occur in young, turbulent galaxies of the early universe. “We have seen the motion of gas in very early galaxies for the first time,” said Dr. Renske Smit from the Kavli Institute of Cosmology at the University of Cambridge, speaking today at a briefing at the American Astronomical Society meeting held this week in Washington D.C. “And while we have identified only two such galaxies, we know that at least some early galaxies must have evolved very rapidly to reach this early maturity." Smit said these first observations of the movement of gas provides unique details about the formation of these galaxies and opens a window to the early universe. Smit and her colleagues used the Atacama Large Millimeter/submillimeter Array (ALMA) in Chile to observe two small newborn galaxies in far-infrared wavelengths, seeing them as they existed 12.9 billion years ago, just 800 million years after the Big Bang. The astronomers peered very deep into the universe to look for light from galaxies that is red-shifted to confirm that these galaxies are very far away. A spectral characteristic of ancient and distant galaxies is strong hydrogen-emission lines, known as Lyman-alpha lines, which appear in a spectrum if the source emits specific wavelengths of radiation. They identified two candidate galaxies using imaging from the Hubble and Spitzer space telescopes, where the data showed these galaxies appeared to have unusually high rates of star formation. Using ALMA to observe the two galaxies, the astronomers saw small frequency shifts. Smits said the early universe was very turbulent, with a lot of gas rapidly streaming into galaxies. Additionally, there were frequent supernovae that could expel gas from galaxies. Smits told Seeker that these two galaxies look very similar to galaxies from about 3 billion years after the Big Bang, which was the peak of star formation in the universe. They are about five times smaller than the Milky Way, but they were forming stars at a higher rate than other young galaxies during that time period. The researchers also gained insight on the shape of the galaxies — whether they are spiral or elliptical. Smits said they need to conduct more observations to determine if these galaxies are truly quite different from others galaxies in that time period or if they represent a larger population of evolved galaxies.